You'd be hard pressed to find a restaurant in Arizona more stunning than Mariposa in Sedona. Architecturally striking on its own, the setting also features magnificent red rock views at every turn. Chef and owner Lisa Dahl worked with over a dozen artisans and craftsmen to extend this majestic beauty throughout the property, which opened its doors in June of 2015. The main dining room with its stunning views reflected in the 23-foot windows. Heading home after a few blissful days spent in beautiful Sedona at Amara Resort and L'Auberge de Sedona, we chose Mariposa as our final culinary destination. Our timing was right too, as Mariposa had just started serving lunch a month before. I can't think of a more beautiful place to linger on a sunny afternoon. As we strolled through the pavered courtyard we noticed details such as the soothing water features, flickering fire elements, weathered metal and stacked stone details, and two inviting picturesque patios. The expansive covered North Terrace beckoned us as the perfect spot to enjoy a leisurely lunch. We were greeted and seated by gregarious maitre d' J.B. Turner, who spent the afternoon telling us about the restaurant and pointing out decor nuances as he took me on a tour. Thank you J.B.! As we opened our menus, I appreciated this heartfelt welcome by Chef Dahl. I was impressed with the craft cocktail menu as J.B. enthusiastically pointed out some of his personal favorites. My Bolivian Mule with Sobieski vodka, Bundaberg ginger beer, and Agwa de Bolivia (a Bolivian coca leaf liqueur made with 37 other botanicals) was the perfect day sipper. I'll be returning just to pull up a stool and enjoy some libations in the Gaucho Bar with its distinctive zinc counter. 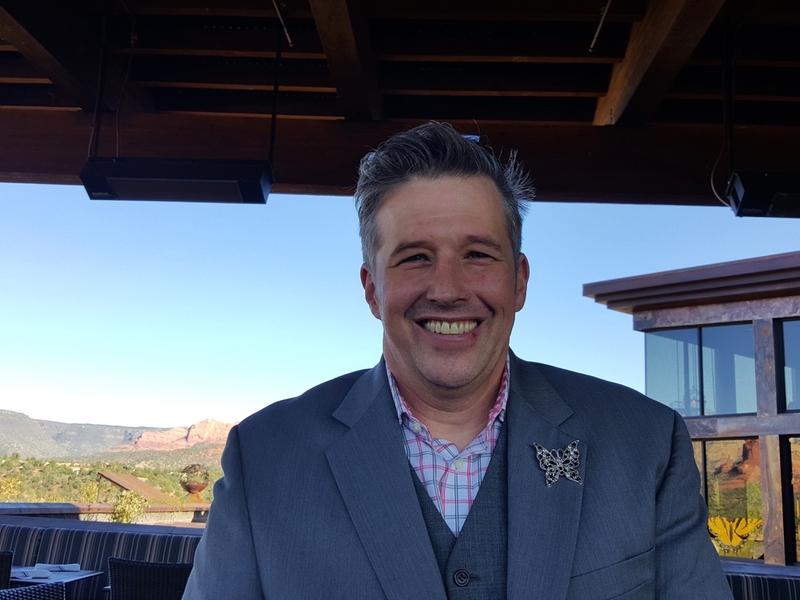 I also had a chance to talk cocktails with Mariposa's knowledgeable Food and Beverage Manager, Rick Kulander, who introduced me to a new favorite tequila, La Magueyera. Our delicious lunch: Sopa de Justino with chicken, quinoa and vegetables named as a tribute to Chef Dahl's son Justin, the Vaquero Burger with Manchego cheese, Beeler’s Pepper Bacon and pimentón aioli with a side of Mariposa potato salad, and creamy pistachio and lemongrass-coconut ‪gelato. We also had flawless service from our friendly waiter Arturo Carrizales. A special treat was being able to chat with the lovely Chef Lisa Dahl herself, who graciously took time out of her busy day to sit down with us. Chef Dahl opened her first restaurant, acclaimed Dahl & Diluca Ristorante Italiano, in 1996. Although I've yet to visit her flagship, her second restaurant, Cucina Rustica, which opened in 2003, is a favorite of ours. In fact, we visited on our very first trip to Sedona after moving from Boston, and we've dined there every trip since. In 2012, her first casual spot, Pisa Lisa, offering wood-fired pizzas, salads and gelato, debuted. This makes Mariposa her fourth, and most ambitious, project. Its South American cuisine draws its inspirations from Chef Dahl's time spent in Argentina, Chile and Uruguay. "I’ve gone to such lengths to make each one distinctly different," Chef Dahl tells me. "This is very contemporary and all about the view. I wanted as a chef to do a Latin inspiration and do something that matched the masculinity, because my other restaurants all have a touch of femininity, especially Dahl & Diluca. Mariposa is more wide open, big, heavy, and sultry. " Artistic details abound. Mariposa means "butterfly" in Spanish, and you'll see this motif echoed throughout in metal sculptures such as the butterfly fire globes by artist Phil McNally gracing the entry or gorgeous butterfly wings represented in panels of stained glass. Look up in the dining room and you'll see black and white films projected on the back wall and unique barbed wire drop lights with Edison bulbs interwoven with ocotillo. An extraordinary first impression is the 800-pound hand-carved front door designed by artisans Zee Haag and Gerardo Leyva inlaid with semi-precious stones, the images of which can be seen on the videos playing in the Gaucho Bar. Chef Dahl notes more details. "If you look at the windows you'll see we have mirrors so you’re getting the reflection. Throughout the dining room there are lots of ways I reflect back the light. It's the beauty of giving back thanks. It's meant to be very introspective and connected. The room is not overly opulent. The opulence is all this," she says as she gestures at the surrounding natural beauty. "People have started saying they appreciate what I wrote in the cover of the menu. It really makes me proud that they’re reading that because they really understand the level of responsibility that this is for me, to be entrusted to take up space on a property that is forever and that is so sacred. When you take the time to really feel what this means, it's a big obligation. It's a responsibility and a privilege." At night the restaurant is illuminated according to Sedona Dark Sky policies so as not to affect the grand canopy of stars. On the dinner menu you can start with tapas such as flaky empanadas or mussels baked with white wine and chorizo, order spicy gazpacho with avocado or hearts of palm salad with shrimp, and then move on to a steak grilled on an authentic Argentinian Parilla. "If I could have planned your day today, I would have said come here for tapas hour so you can watch the sun go down, eat empanadas and chorizo, and stay for dinner", Chef Dahl says. "We have the chimichurris on the steak, a delicious black beans and quinoa that you might have in Peru, we do a shrimp ceviche and a lot of fish. It's our own style." "Natural is still what most people want, very clean and very true flavors. You can impress with a really glorious presentation, but where they will come back over and over is where the food really speaks." "And that is really the philosophy that carries Cucina, Dahl, Pisa, and Mariposa. No matter what the food is, you can tell you’re in one of my restaurants because the flavors are all there. They’re vibrant, they're not overly fussy. I think Mariposa could become kind of a landmark here and I’m very proud of that. If the food is equal to the energy of the atmosphere and environment, truly, potentially, it could be one of the great restaurants of Arizona." Mariposa Latin Inspired Grill is located at 700 AZ-89A, Sedona, AZ 86336. It is open 7 days a week for lunch and dinner, 11:30 AM–2:30 PM, and 4–9 PM. Call (928) 862-4444 for reservations.